Below is Aaron's inventory of unused and used cast film lines. 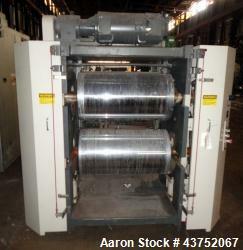 If you are looking to sell your used cast film line submit a request online or contact Erik Eichert at 630-238-7480. Used- Cincinnati Milacron (2) Roll Stack. Sheet take-off with 34" face x nominal 18" diameter rolls mounted in a vertical arrangement with temperature control system and pull rolls. Last used with a 2.5" extrusion line. Used- PTI 50" Wide S Wrap Pull Roll Assembly, Model SWU. 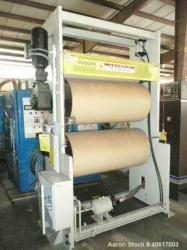 (2) 24" diameter x 50" wide pneumatically adjustable polyurethane rolls, each roll driven by a gearmotor. Top mounted 6" diameter rubber nip roll. Built 2006. Used- 92? x 36? O.D. Textured Chill Roll. Used- Bare Middle Cooling Roll. 36" O.D. x 92" face. For Schkopau PV film line. Used- 92" x 36" O.D. Textured Chill Roll.